The Venice II is a Universal wallet phone clutch featuring a front pocket with a metal twist lock for holding small items such as a cellphone. The wallet has 9 card holders and one clear ID card holder to make it easy to organize the essential cards. 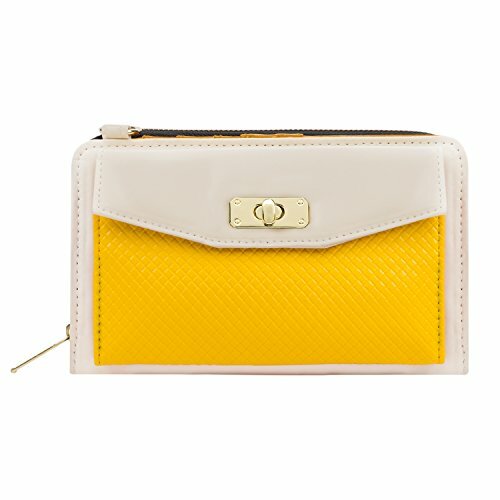 Venice II has spacious interior pocket to store multiple small items such as money, makeup, pens, etc. The Exterior is made of PU leather with matching strap along with dual chains for additional height Adjustment and choice of style. The Venice II could be worn in various carrying options: Clutch, Cross-body, or Shoulder. Exterior dimensions: 7.75" x 2.25" x 5.25" | Cellphone compartment dimensions: 6.3" x 0.75" x 3.6" | Strap: 65.6" Drop: 38"